Lake Austin, formerly Lake McDonald, is a water reservoir on the Colorado River in Austin, Texas. The reservoir was formed in 1939 by the construction of Tom Miller Dam by the Lower Colorado River Authority. Lake Austin is one of the seven Highland Lakes created by the LCRA, and is used for flood control, electrical power generation, and recreation. 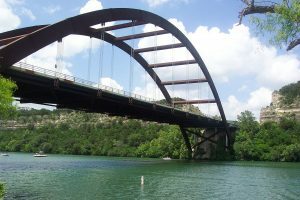 Lake Austin is a part of the Colorado River; it begins below Mansfield Dam and is principally fed by the outflow of Lake Travis. The lake meanders generally from northwest to southeast, with few significant tributaries; the largest are Bull Creek, entering from the north near where Loop 360 spans the lake at the Pennybacker Bridge, and Bee Creek, entering from the west just above Tom Miller Dam, where the lake ends. Its outflow through Tom Miller Dam then becomes the principal inflow for Lady Bird Lake. 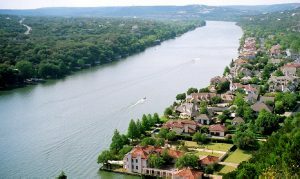 Lake Austin Marina: Located near the Tom Miller Dam on the west shore of Lake Austin, the Lake Austin Marina is Austin’s premier full-service marina and office park. Not only are we a designated clean marina with solar panels, lighting retrofit, window solar shades, additional insulation, new HVAC system and new cool radiant heat reflected roofs installed we have performed enough to be LEED certified. Our marina features 168 boat slips of varying sizes and features, as well as a Ship Store. We also are home to some of Austin’s most luxurious commercial office space. Come see for yourself why the Lake Austin Marina is THE place to be, whether for work or fun in the sun! 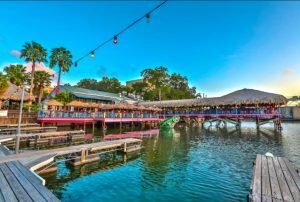 Hula Hut: The Hula Hut overlooks beautiful Lake Austin. This is a traditional Tex-Mex with a Polynesian twist that all culminates into the finest “Mexonesian” cuisines. Hang loose and groove to some tunes in any of the three bars. Enjoy the scene with an Mango Margarita and dive into the lavish Pu Pu Platters. 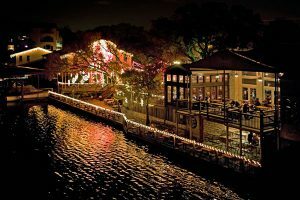 Abel’s on the Lake: Abel’s on the Lake is the prime spot to come enjoy a drink with your friends. With spectacular views of Lake Austin, the fare includes great food, mixed drinks and a selection of over sixty beers on tap, including seventeen local brews. To put it simply, Abel’s serves American food with a Texas Drawl. Nothing is better than a beautiful day on the water! Stop by to enjoy our beautiful view of the lake while eating some of our fantastic food. Abel’s on the Lake has breathtaking views, full bar, friendly staff, amazing food and gorgeous sunsets. A huge double deck on Lake Austin make this the perfect place! Mozart’s Coffee Roasters: Mozart’s Coffee Roasters is a leading upscale roaster and brand of specialty coffee in Austin. For over fifteen years, they’ve roasted the “finest coffees of the world”. With roasted coffees diminishing in flavor just days after roasting, Mozart’s Coffee Roasters stands apart with its on-premise roasting assuring patrons the highest degree of freshness, flavor and quality. Relax in the tranquil setting of timeless, rare beauty with friends from far and wide. Mozart’s incomparable beauty and the very best specialty beverages, famous cheesecakes, desserts and pastries by the Mozart’s bakery translate into a must-see spot in Austin. On any given morning, afternoon or evening you can find tourists and locals of all ages enjoying a peaceful refuge with their favorite flavor and aroma of a superb cup of Mozart’s coffee. 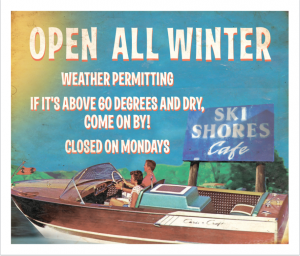 Ski Shores: Austin laid-back since 1954. Burgers, pizzas, appetizers & full bar. We have the same great pizza and hamburgers you remember from the past years with even better options. Choose from tons of cheesy pizzas, hot and juicy burgers, fresh salads and more! Come by boat, car or bike. The important part is that you make it here! Lake Austin Spa: Discover an Intimate Hideaway Where Extraordinary Experiences Begin. 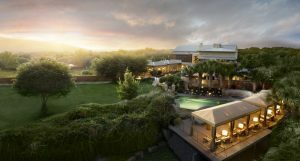 Tucked away in the beautiful Texas Hill Country on the shores of Lake Austin, our all-inclusive 40 room luxury spa resort offers a truly unique experience. Let Lake Austin Spa Resort cater to your well-being and provide a sanctuary for rest and renewal. Pennybacker (360) Bridge: The Percy V. Pennybacker Jr. Bridge in Austin, Texas, is a through-arch bridge across Lake Austin which connects the northern and southern sections of the Loop 360 highway, also known as the “Capital of Texas Highway.” The road is widely considered one of the most scenic urban drives in Texas, in large part due to this arched weathering-steel bridge and the rolling hills that flank the road. 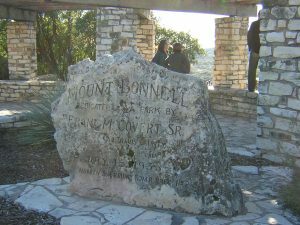 Mt Bonnell: Also known as Covert Park, is a prominent point alongside the Lake Austin portion of the Colorado River in Austin, Texas. It has been a popular tourist destination since the 1850s.The mount provides a vista for viewing the city of Austin, Lake Austin, and the surrounding hills. It was designated a Recorded Texas Historic Landmark in 1969, bearing Marker number 6473, and was listed on the National Register of Historic Places in 2015.